Tracking a major storm pushing in from the west that will bring wind and freezing rain to northern New England. 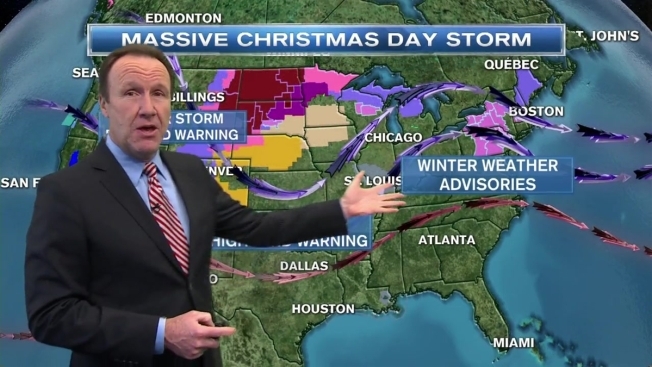 Did you get new weather instruments for Christmas? Your barometer is probably reading somewhere up around 30.7 inches, almost as high as it gets. High barometer usually means low thermometer. Our Monday starts off with sunshine, temperatures ranging from near zero in the far north to 25° along South Coast. As the high-pressure system moves out to sea, a powerful low-pressure system is pushing into Ontario. The pressure gradient between the two systems is going to generate damaging wind in New England overnight Monday. Most of the day is dry, with a high temperature in the 30s. Wind will be increasing from the Southwest gusting past 30 mph late in the day. We also have the possibility of some light rain developing toward sunset, with temperature still near freezing. We are warming faster high in the sky, than down near the ground. This may result in some icing for the evening hours. For most of New England we have plain or rain overnight with temperatures climbing from the 30s into the 40s. The exception is northern New Hampshire were freezing rain is possible, and in much of central and northern Maine where snow is likely. Wind from the south increases, sustained 25 to 30 mph, with gusts of 50 to 60 mph. Rain showers in southern New England should end early Tuesday, followed by partial clearing. Initially mild temperatures in the 50s for southeastern New England will cool through the 40s into the 30s late in the day and in the evening. Wednesday looks fair and seasonable. The next front on Thursday may generate a period of snow, perhaps mixed with rain in eastern New England. Friday looks bright and brisk with temperature back down to lower 30s. The early call on Saturday is for fading sunshine and a high temperature close to 40°. New Year's Eve may feature a period of rain or snow, especially late at night. Our New Year's Day could have a coating of snow early. There's a lot of action this week, we will give more details as we get closer.